Looking for a great activity for your kids to take on trips? You will love these Melissa & Doug Water Coloring Pads on Amazon at 25% off! 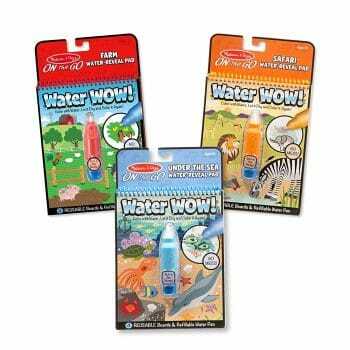 This deal includes 3 water-reveal pads and pens! Each pad has 4 reusable picture pages, and you can refill the pen with water whenever you need! The 3 pads have 3 different themes: safari, on the farm, and under the sea! It’s a great activity for kids ages 3-7 to work on their fine motor skills, and they can reuse it as much as they want! Original price is $14.99, but now you can get it for $11.19 and save 25%!